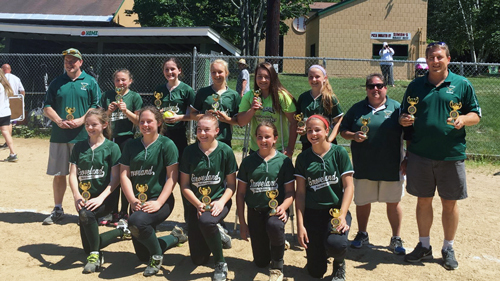 Groveland Youth Softball (GYS) is established for the purpose of, and is wholly dedicated to, providing area youth with supervised, fundamental learning experiences in the game of softball. And to organize, manage, and develop amateur youth softball programs, specifically designed for school- aged youth girls. GYS is to conduct its activities so that the physical and moral welfare of the young people, for whose benefit it is organized, shall remain paramount, and all matters of policy shall be determined on that basis. Groveland Youth Softball is now accepting players for our 2019 Spring Season. Registration is open to any Groveland girl in grade K to 8th, all skill sets are welcome. Click on the REGISTER NOW button on the right side of the screen. Registration must be completed by March 31st for grades 5th to 8th, April 15 for K to 4th. Season starts in April and ends in June. We will be offering free weekly indoor skills and drills sessions to grades 5 to 8 starting in March. Sign up now to participate!! If you have any questions, please contact Groveland Softball Director, Dan Stewart at Phone 508-367-6993. ECWSL Senior Championship for 2016! They may not keep score but these girls are winners!! !